Pinch Collar Medium - Leather Medium 23. $28.95. It works like a charm! Instant healing and no pulling at the leash. And much more subtle than those metal contraptions. I like the leather better than nylon pinch collar. Really well made, and works great. The only thing I would change is to make the leather thicker that holds the D ring for leash attachment. It has not broke or caused any issues with use, and I use the collar daily, it is just not as robust as the rest of the collar. My dog had no problems adjusting to the collar. He sits still and waits for me to put it on him. Twenty years ago when we trialed our dogs extensively we purchased all our dog supplies from your company. Now that we are getting back into upland hunting is great to know your still providing quality products and great service. Thanks. Great collar, and the medium fits my 50 pound English Setter well. I use it to run with my pup, and it makes the experience much more enjoyable for both of us. Haven't had a chance to use it yet. May need a larger size. "This is a top-quality pinch collar, allowing easy control of even the most willful dog." 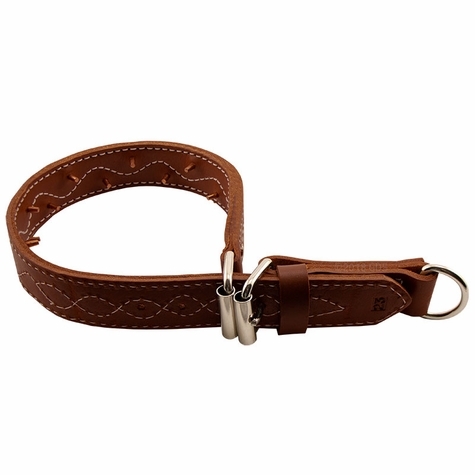 This is a top-quality pinch collar, allowing easy control of even the most willful dog. I had to punch an additional hole to make the collar large enough to slip over my 57 pound dog's head without causing him to object to the spikes. "This collar makes whoa breaking a snap." This collar makes whoa breaking a snap. 10 minutes a day for 6 wks, and you have a rock solid whoa broke dog. Great service and shipping speed from Gun Dog Supply. "Much better than the link chain collar." Much better than the link chain collar. The leather collar doesn't come apart. A little difficult at times to get around the pups neck, but we deal with it. Bottom line, it works for what it was intended for. Used glove leather to soften it up. "I can't imagine trying to train a dog to heel without this. " I can't imagine trying to train a dog to heel without this. I had the traditional prong-collar, but I just never put it on my dog. This collar works wonderfully. It took Atticus no time to obey the heel command. Works great!! No complaints. Will be purchasing more for this site this week. Great customer satisfaction. Love the site. "Better than the nylon collar option as these are sized." Better than the nylon collar option as these are sized. "Choke collars were not working, so when I put this collar on, the pup started to listen." Choke collars were not working, so when I put this collar on, the pup started to listen. When he would put pressure against the collar, he would start to respond to instructions rather than keep pulling against the collar. "This really is a "miracle" event for me. I wish I had ordered this collar months ago." I was without hope of being able to train my 26 pound Boston Terrier. He is high energy, easily excited and always getting into things that are off limits. I was unable to control him on the leash if he saw, heard or smelled the scent of another dog. I purchased a number of different style collars and not one of them could control my Boston Terrier. As a last resort I ordered a leather pinch collar and within two days he is responding extremely well. Today we HEARD other dogs and he pulled slightly but with a mild correction, he was back in step. This really is a "miracle" event for me. I wish I had ordered this collar months ago. "Even my small children can walk him with no problem"
I have a GSP that is normally bouncing off the walls. Normally I could barely control him on a leash, but with this even my small children can walk him with no problem. It also looks better than the cheap metal pinch collars. I have 2 GSP pups, and they are very excited to go out for a walk. Choke chains were useless. This collar makes them behave nicely on the lead without too much reminding to heel. I recommend it if your little fellow just cannot stop pulling. "Before getting this collar my wife refused to walk the dog because he would hurt her shoulder"
wheaton terrier. Family pet. Competes. "Would take this over a metal choke or pinch collar any day." Would take this over a metal choke or pinch collar any day. This is the pinch collar described in the Delmar Smith method. Works great. "Better response to this than the all metal collar." Better response to this than the all metal collar. Easier to attach than the metal 'claws' that need to be pinched to take on & off, but not the metal pinch w/ a snap release. "The only collar that gave me total control over my 1 year old setter." This collar is the only collar that gave me total control over my 1 year old setter. Training is is better and more effective now. "This collar has made my walks so much more enjoyable"
This collar has made my walks so much more enjoyable. It's well constructed and inexpensive. My energetic Shorthair is heeling nicely, thanks to this collar. I'd highly recommend this collar. "Very nice collar that allows the dog to respond well"
Very nice collar that allows the dog to respond well without the intimidating look of a traditional pinch collar. Love it. My 2 year old male Vizsla pulls extremely hard and very frequently. This collar is great and makes walking around pleasurable around the city. My dog is much more obedient with this collar on and is less pulley. "Fantastic product as usual from Gun Dog Supply"
Fantastic product as usual from Gun Dog Supply... High quality craftsmanship and works as intended. "This collar has made working and training this pup much easier." This collar has made working and training this pup much easier. Corrections and understanding the corrections come much faster. The collar works well. I probably should have ordered the next smaller size, but my dog was right between the sizes according to the chart, and I figured better a little too big rather than too small. "I would like the collar more if the leather didn't change width between the buckle and the main collar." I would like the collar more if the leather didn't change width between the buckle and the main collar. The spring in the collar from tight to loose would be greater. I showed it to my trainer and another student, and that's also what they observed. Maybe the collar is too big for my dog. He has a 17" neck. Well constructed and easy to use. I have used these pinch collars for decades in obedience training with good success. But sometimes leather collars lack the pinching power of a metal pinch collar that a high powered pup often needs to get under control. There are a couple of problems with this collar. My biggest problem with it is that the metal buckle that should allow the pinch collar to travel when pulled tight gets hung up on the leather side where it widens. 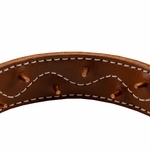 It's a few mm too narrow of a buckle. This can lead to a missed correction or command depending on how you train. Consistency and timing are paramount in training and this flaw jeopardizes both. The second problem I have with this collar is the level of 'stiffness' in the leather used. A good pinch collar should 'spring' open when pressure is relieved. 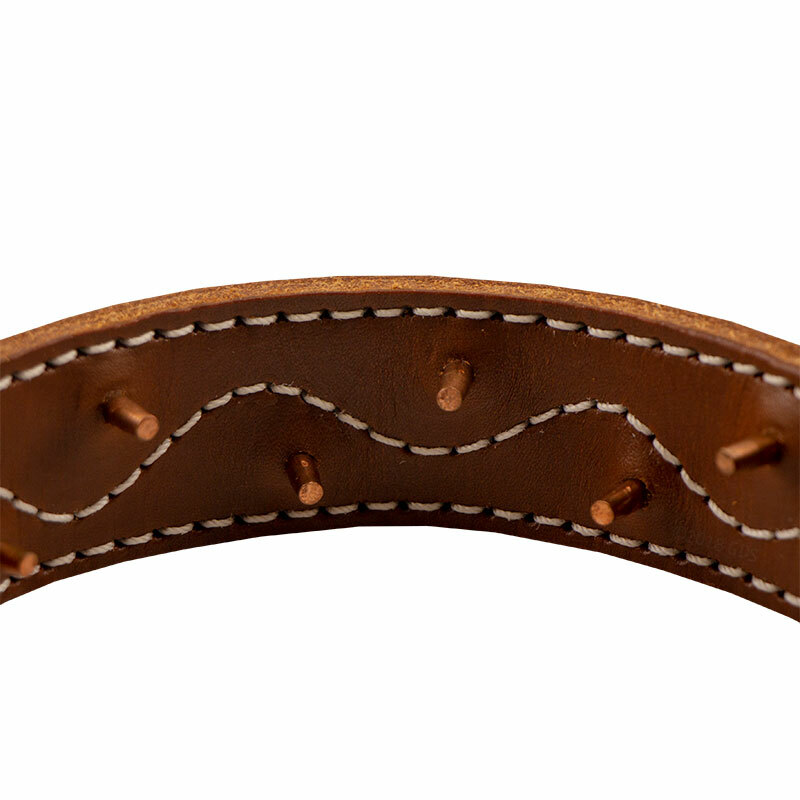 The leather in this collar is soft and therefore does not spring open to relieve pressure in a timely manner. Again, jeopardizing training opportunities. The 2 star is a result of the low cost of the collar. I'd recommend spending more for a higher quality collar ~10-15 bucks usually. Pinch Collar - Leather Medium 23"
Heavy two-ply leather collar with blunt copper spikes. 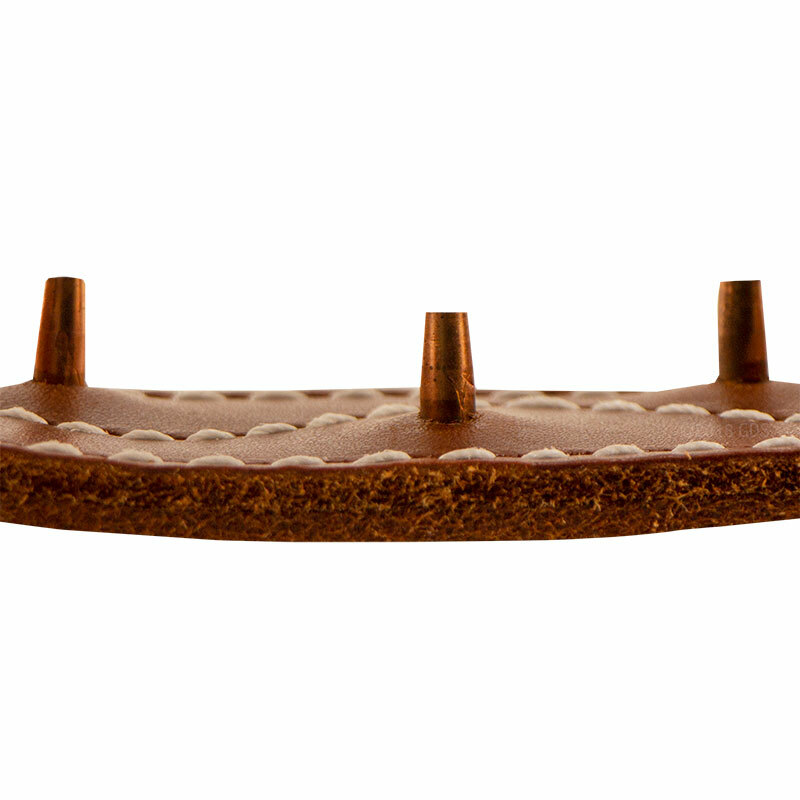 LEATHER FORCE (PINCH) Training Collar 1 1/4" wide heavy two-ply leather collar with blunt copper spikes, heavily stitched for re-enforcement, excellent tool for obedience and "whoa" training. Medium fits most Pointers, Setters, and Brittanys. This collar will fit the following actual neck sizes: 15", and 16".